What if we didn’t need freshwater ecosystems for drinkable water? What if the world ran dry, but it wouldn’t change a thing? But as our water is drying up, scientists have been working on a solution that just might change everything. We’ve taken water from the earth, from the rain – but when that’s all gone, can we survive by harvesting water from thin air? Atmospheric Water Generators may not be new to the arsenal of technologies used to combat the Global Water Crisis, but it is certainly becoming more prevalent as the world is scrambling for alternative water sources. These machines are built to be energy efficient and effective, even in dry climates where water is nowhere to be seen. The technology absorbs clean air to be dehumidified before water is drawn from the condensation and held inside a tank. The water then enters a filtration system that removes all harmful bacteria and chemicals. Companies like GENAQ are already using their technology to respond to emergency situations around the world where people are lacking sufficient water resources. Another water company known as WaterGen is utilizing and expanding their means of water production. Whereas most Atmospheric Water Generators are large and portable, WaterGen has created an even smaller generator called Spring. The unit is designed to carry like a back-pack and can filter up to 180 liters of water on the go. The portable generator was used in 2013 by the Israel Defense Forces to deliver clean water to the Philippines after Typhoon Haiyan. The successful application of this fascinating technology gives hope to areas dreading their “Day Zero”, but could this technology really save the world? WaterGen certainly thinks so, as their Large Scale machines are designed for rural and urban areas. By installing the generators on rooftops, WaterGen creates a sustainable water resource that limits water consumption from natural ecosystems. The machine can produce up to 5,000 liters a day while the average family only requires between 300-500 liters. 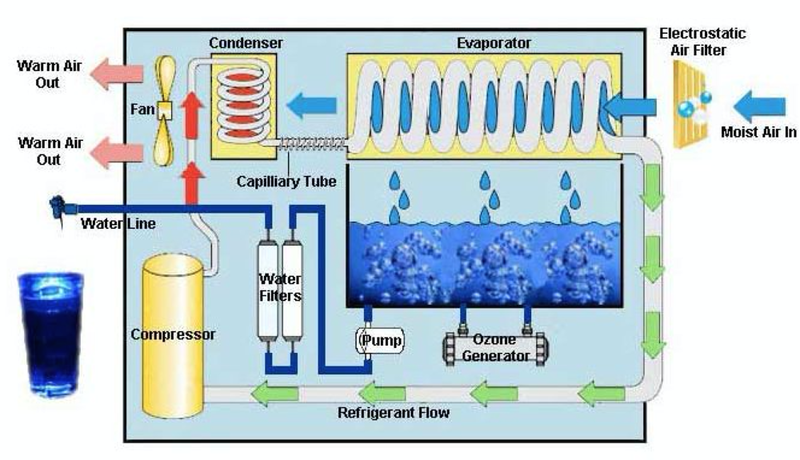 Small scale water generators are already available for offices and households, making water vapor technology more common place than we know. With the implementation of this technology citywide, renewable water reservoirs will certainly not be lacking. Our world is divided between those who over-consume and entirely lack water, but if Atmospheric Water Generators are truly a solution to the Global Water Crisis, then the world could be united by the water we share. Although Wine To Water does not utilize Atmospheric Water Generators of any size, our organization is excited to see how this technology will continue to be used in the field and potentially change the world.